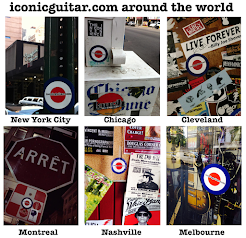 iconic guitar.com: B.B. King - "Lucille"
Lucille in her current form is a stereo, vari-tone Gibson ES-355. B.B. has been playing the ES-355 for at least 25 years, before that he played an ES-335. The main difference between those two guitars is that the ES-355 appears to be a solid body, due to its lack of f-holes. B.B. likes to think of the ES-355 as the "big brother" of Gibson's Les Paul. Although B.B. is partial to Gibson guitars, he has played just about any guitar he has gotten his hands on. His very first guitar was a Stella acoustic. 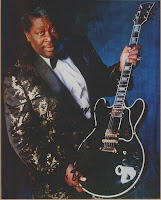 Early in his career, he played and owned many different makes, such as Fender, Gretsch, Silverstone and of course Gibson. Please pardon me for correcting you but you're mistaken about the differences between the ES 335 and ES 355. The 'Lucille' model is essentially a stereo, vari-tone 355 which is semi-hollow but appears to be solid because it lacks F holes in an effort to cut down on feed back. Thanks Binky. Edited per your comment.